It would take a couple films to properly bring the Marvel Comics character Venom to the screen. First you would have to do a Spider-Man movie in which Spider-Man finds himself in possession of a black suit of alien origin that starts to affect his behavior and try to take control of him. This suit is actually an alien symbiote, a living creature that bonds with a host. Spider-Man would then get rid of the symbiote, but then it ends up attaching itself to a fellow named Eddie Brock. In the comic book source material, Brock was a journalist for the Daily Globe who wrote an article revealing the identity of the serial killer Sin-Eater, but was then humiliated when Spider-Man catches Sin-Eater and it's not the man Brock believed it to be. 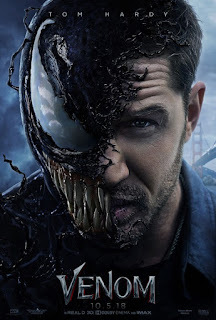 Since both of them have issues with Spider-Man, the symbiote and Brock join together to become the villain Venom, which is something to save for the second movie. A version of that story (minus Sin-Eater) was jammed into just one movie, 2007's Spider-Man 3, when director Sam Raimi was forced to add Venom into a film he/it was (or they were) never intended to be in, and the results were poorly received. But Venom is a popular character, and soon after the release of Spider-Man 3 Sony started talking about making a Venom solo film. It took ten years for that film to makes its way through development hell, but the film finally did get made and released. 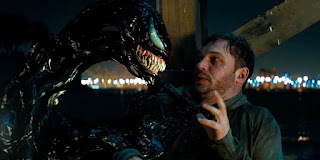 Directed by Ruben Fleischer from a screenplay by Jeff Pinkner, Scott Rosenberg, and Kelly Marcel, the Venom solo film not only disregards the origin story told in Spider-Man 3 (which, in the Spidey world, is now two reboots ago anyway), it drops the Spider-Man connection entirely. Spider-Man is busy mingling with the heroes of the Marvel Cinematic Universe right now, appearing in films like Captain America: Civil War, Spider-Man: Homecoming, and Avengers: Infinity War, he doesn't have time for symbiote shenanigans right now. In the comics, Eddie Brock and Venom eventually made peace with Spider-Man and became an antihero, agreeing to leave Spidey's New York territory and moving out to San Francisco. In this film, Brock, played by Tom Hardy, is an investigative journalist who is already living and working in San Francisco when the story begins, having left New York behind due to some kind of incident there when he was working for the Daily Globe. Now Brock has his own show, The Eddie Brock Report, and is given the chance to interview Carlton Drake (Riz Ahmed), head of a corporation called Life Foundation. Drake appears to be a good guy who's dedicated to finding news ways to treat and cure diseases, even if those treatments can only be found by funding space exploration... but Brock has caught word that Drake has been carrying out fatal pharamaceutical testing on human patients, and when he openly accuses Drake of that, it's a disastrous repeat of the Daily Globe incident. Brock loses his job. His fiancée Annie (Michelle Williams, wasted in this role), a lawyer who was working for Life Foundation, loses her job and leaves him. This Brock now has serious reason to hate Drake and Life Foundation. Drake also happens to be responsible for the arrival of the Venom symbiote, and other symbiotes, on Earth. One of his space probes recently crashed in Malaysia with the other symbiotes still contained on board, but a symbiote called Riot managed to escape and attach itself to an astronaut named Jameson (Chris O'Hara) - and comic readers will know this is the son of J. Jonah Jameson, editor-in-chief of the New York newspaper Daily Bugle, where Spider-Man's alter ego Peter Parker works. In the comics, Jameson became the villain Man-Wolf after finding a magical ruby on the moon. Here, he's very briefly infected by the Riot symbiote before it passes on to another host. First Riot moves on to a female paramedic tending to Jameson in the back of a speeding ambulance after he's retrieved from the crash site. The ambulance crashes and the paramedic walks out with a nasty compound fracture in one leg. The symbiote is able to heal this fracture within seconds. That compound fracture was a surprising thing to see in a movie that's rated PG-13. A lot of people thought Venom should have been rated R, but I really don't think it's necessary. Sure, symbiotes mess people up and occasionally eat them, but on the page most of that has happened in issues that were approved by the Comics Code Authority, so I'm fine with the movie having a PG-13 rating. That said, when I was ten I took a Comics Code approved issue of the symbiote-filled Spider-Man event Maximum Carnage to school and a teacher confiscated it for being too violent. Brock gets a shot at redemption when he's contacted by Life Foundation scientist Dora Skirth (Jenny Slate) and notified that Drake is up to some shady business, including conducting fatal symbiote tests on homeless people. Skirth gets Brock into Drake's secret labs, and while he's in there he gets infected by the Venom symbiote. So when he escapes from the place after security alarms go off, he soon finds himself being hunted by an army of Life Foundation lackeys. While running for his life, Brock also has to deal with the fact that he now has an alien being living within his body. You might think this would be handled in a dark and creepy way - especially since the people Drake is trying to bond with the symbiotes keep dying, and the Riot hosts act like superpowered zombies - but it's actually played for laughs. Suddenly this is like a Jim Carrey comedy with Hardy in the Carrey role, fighting against his own body and reacting to the voice in his head. You could also compare Hardy to Adam Sandler, since he's now becoming known for making odd vocal choices for his characters like Sandler too often does. Hardy's Brock voice is... unexpected. The symbiote also brings action into the film, proving to be quite helpful when Brock has to fight for his life while under attack by Drake's henchmen. 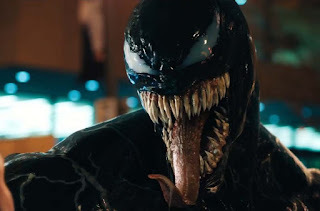 It does take a surprisingly long time for a proper action sequence to come along in the film, and a disappointingly long time for the symbiote to take over Brock's body in full-on, slimy, big-toothed, long-tongue Venom mode. This is the problem with some origin stories, they make you wait so long to see the characters that you're watching the thing to see in the first place. When you have a star of Hardy's caliber you do need to show them a lot, but I didn't watch Venom to see Tom Hardy with tentacles of slime popping out of him during action scenes, I watched the movie to see Venom in the action scenes. I also expected to see more symbiotes in general. Fleischer had said that the film was inspired by the Venom storylines Lethal Protector and Planet of the Symbiotes, both of which feature multiple symbiote villains. Planet of the Symbiotes even has an invading force of symbiotes coming to Earth from their home planet. I didn't think the movie would go that far, but something closer to Lethal Protector, in which Venom had to fight five villainous symbiotes: Scream, Phage, Lasher, Agony, and Riot. Instead only Riot made it to the screen, and I didn't really find Riot to be worthy of being the solo villain in a movie. That's what we got, though. Venom vs. Riot, which has bonded with Drake by the end of the film, so it's also Brock vs. Drake in the climactic confrontation. I was never in favor of Sony making a solo Venom movie that didn't spin off from the origin being properly told in a couple Spider-Man movies. Then again, it doesn't look like such Spider-Man movies are going to happen any time soon - and now, since this movie has been made and released, it's definitely not going to be happening in any Spider-Man movie that's connected to the MCU. So, accepting Venom on its own terms as what it is, I found it to be decent entertainment. I wasn't completely satisfied with it, I would have preferred more action, more Venom, and more symbiotes, but it's a fun little movie. Underwhelming, yet fun. Also known as Trabalhar Cansa in its native Portuguese, Hard Labor is a 2011 Brazilian movie from the writing/directing duo of Marco Dutra and Juliana Rojas. It's a film I didn't understand, as I didn't know what the hell was going on in it, and I couldn't even really tell you why I enjoyed watching it. But I did enjoy the viewing experience, despite the thoroughly unsatisfying and confusing ending. The story centers on Helena (Helena Albergaria) and Otávio (Marat Descartes), a married couple with a precarious financial situation. Otávio has just lost his job, while Helena has just decided to start running a grocery store for reasons we're not quite sure of. While Otávio sets out on a soul-crushing search for a new job, Helena has to focus all of her attention on running the market, because their well-being now depends on its success... so it really doesn't help their lives when items begin mysteriously disappearing from the store, or when a disgusting leak of some sort starts destroying a wall and messing up the nearby floor. Meanwhile, the couple hires a nanny (Naloana Lima) to take care of their young daughter (Marina Flores), since they're too busy to handle things around their household. The nanny doesn't have a great impact on the overall story, but she still has a good amount of screen time dedicated to her, and she's the most likeable person in the film. Hard Labor is largely an examination of the lives of some working class people in Brazil, but there's also a horror element in the mix thanks to that leak in the store and what's causing it. That plotline takes a strange and intriguing turn, but don't expect it to have any explanation or, apparently, any lasting impact on the characters. This was an interesting movie to watch, but I wish I knew what Dutra and Rojas were trying to get across with it so I could figure out whether or not it's as half baked as the final moments made it seem to be. Writer/director Darren Aronofsky's arthouse horror film mother! was left wide open for interpretation, making it a "love it or hate it" film in most cases. Viewers will either enjoy trying to craft theories to make sense of the allegories and metaphors, or they're going to be upset that the movie doesn't tell a straightforward story or give any explanations for the weirdness Aronofsky packed into its 2 hours. Blog contributor Priscilla and I watched the movie together and tossed some theories around, but I'm not confident I could take you what anything in the movie really meant... But that doesn't mean I didn't enjoy watching its strange, twisted events unfold. Nor does it mean I didn't find it to be an effective horror story - in fact, I found it to be very relateable and unnerving. Jennifer Lawrence stars as a young woman married to an older man (Javier Bardem), a writer who has been struggling to find inspiration for new things to write. They live in a large, isolated country home that was once destroyed by fire, but which Lawrence's character has been rebuilding piece by piece out of love for her husband. We see that she cares deeply about the restoration of this house... but then uninvited guests start showing up at their door, flooding through their home, and we watch Lawrence's character experience the horror of having to see your world torn apart by uncaring, unthinking people. It's a terrible situation, even before taking into account the supernatural elements and the bloodshed that ensues. People not being careful or considerate when handling my possessions has caused me a great deal of stress and sadness in recent times, so I could totally sympathize with Lawrence's character. And the people who barge into her home do a lot worse than anyone has done to my stuff. Seven years after Vincent Price starred as The Last Man on Earth in an adaptation of the Richard Matheson novel titled I Am Legend, Charlton Heston took the lead in the I Am Legend adaptation The Omega Man, which was directed by Boris Sagal from a screenplay by John William Corrington and Joyce H. Corrington. Heston plays Robert Neville, a former military man / science who now seems to be the only living man in Los Angeles, if not in the entire world. He gets a great introduction, driving around the deserted city streets in a convertible, listening to 8 track tapes, and stopping to inexplicably fire a submachine gun through the window of a building while a shadowy figure scurries away inside. We'll soon find out why Neville is so jumpy... after we watch him take a different vehicle from an abandoned dealership and then take in a private theatrical screening of the Woodstock documentary. Neville may be the last man, but there are other creatures residing in L.A. now. Pale-skinned, cloak-wearing things that call themselves The Family and used to be people before they were infected by the plague that wiped out humanity - which Neville managed to immunize only himself against. The plague hit in the first half of 1975, caused by biological warfare. Now it's the summer of 1977, and for two years Neville has been waging war against the creatures that come out at night to stand outside his home and taunt him. It seems like it would be pretty easy for the creatures, led by Licence to Kill's Anthony Zerbe as Matthias, to destroy the house and get to Neville, even without the use of advanced weaponry that Matthias believes should be left in the past, but they have no luck with their fireball catapault. Eventually Neville will discover that there aren't just the plague mutants and himself in this fight. There are other people out there who are in danger of becoming like Matthias and his fellow Family members. Now Neville has to figure out how to use the knowledge he used to save himself from the plague to save these people. The Last Man on Earth has its fans and gets some play, especially since it's a public domain movie, but The Omega Man generally seems to be the more popular film, and I can see why. It has a bigger budget, allowing for bigger action sequences and heavier firepower. When Price's Last Man busted into an armory, all he grabbed was some smoke bombs. Neville prefers to send bullets flying. Lots of bullets. The Omega Man also has a slight touch of the blaxploitation style that was popular at the time. A prominent Family member is an African American who refers to Neville's home as a "honky paradise", and the first person Neville meets is Lisa (Rosalind Cash), a tough-talking African American woman with an afro. Lisa becomes a love interest for Neville, and the interracial kiss they share has been celebrated as a boundary breaker in cinema. Cash had trouble pushing Heston's past roles out of her mind when sharing intimate scenes with him, though. As she said, "It feels strange to screw Moses." While I still prefer The Last Man on Earth, and appreciate that it stuck closer to Matheson's novel than The Omega Man does, this is an entertaining take on the material with some fun action and character interactions. It was claiming to be slightly futuristic at the time of its release, but now it's obviously a product of that exact time.